We had a posting last month that generated tremendous debate on Facebook. A few said we were simply fear mongering. The role of this Blog, however, is to lay out the facts and some of those facts are frightful. This is the case when we discuss EMPs in light of developments by North Korea, Iran, and others. Our goal is to inform rather than frighten. Take this information for what it is worth. We are simply reposting the views of colleagues dedicated to protecting America. An EMP weapon, as described below is not intended to directly kill individuals. In fact, the direct casualties would be virtually nonexistent. Rather, the attack would be designed against our economy and infrastructure, not dissimilar to a massive computer hacking designed to shut down the Internet….only worse. The information comes from Lt. General Daniel Graham and Ambassador Henry Cooper, both experts on missile defense who advised and worked with President Ronald Reagan. It is very concerning that their view on how an EMP might be used as a threat against America matches with the development and rhetoric of both North Korea and Iran. We are not making claim that there will be an EMP attack, but we have spoken with top people in the current Administration as well as the larger defense and intelligence establishment who have validated that this is a serious issue and risk. Fortunately, some have been working to address the risk. April 24, 2013 – No Monkey Business – Shut the Back Door! 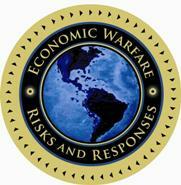 High Frontier . . Building Truly Effective Defenses . . Reagan’s Vision Lives! No Monkey Business—Shut the Back Door! Our last several emails observed that North Korea can place a lightweight nuclear weapon on one of their satellites, launch it over the south pole and detonate it while in low earth orbit over the United States. They have demonstrated this inherent capability, and the U. S. does not appear ready to defend against this threat, though there are possibilities. As discussed in our April 8 email report, North Korea reportedly has launched a 220 pound satellite to their south, as indicated in the left side of the figure below, into an orbit that passes over the U.S. at an altitude of 300-350 miles. 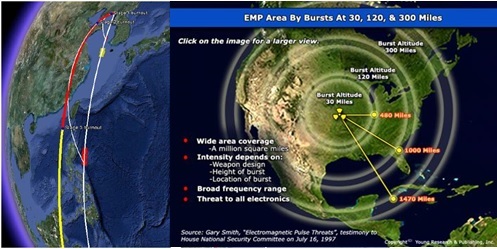 A nuclear weapon that fits into that weight constraint could be detonated to produce an electromagnetic pulse that would cover the entire United States, as indicated in the right hand figure. The result would be that the U.S. electric power grid would be shut down for an indefinite time, and a couple hundred million Americans could perish within a year from starvation and the consequent chaotic conditions. A heavier nuclear weapon could also be placed in a similar but lower orbit that passes over the U.S. For example, a nuclear weapon detonated in a 120 mile high orbit would produce an EMP effect over most of the U.S. No doubt, the electric power grid that is not directly permanently damaged would be damaged by cascading failures of the grid. Perhaps North Korea is not inclined to conduct such an attack—perhaps Kim Jong Un is only seeking to impress his military or seeking favors from the United States in return for North Korea’s return to the status quo ante. And hopefully he will back down. Hope springs eternal. But a greater danger may be from Iran—which also has orbited satellites by launching them to the south rather than to the north—so they also are potentially postured to achieve an ability to attack the United States from the south. And they may be more interested in killing many Americans of the “Great Satan” than North Korea. As illustrated in the figure at the right, the Congressional Research Service described in December 2012 a new launch site, which Iran’s Defense Minister Vahdi indicated in June 2012 was about 80% complete, at the entrance of the Persian Gulf. 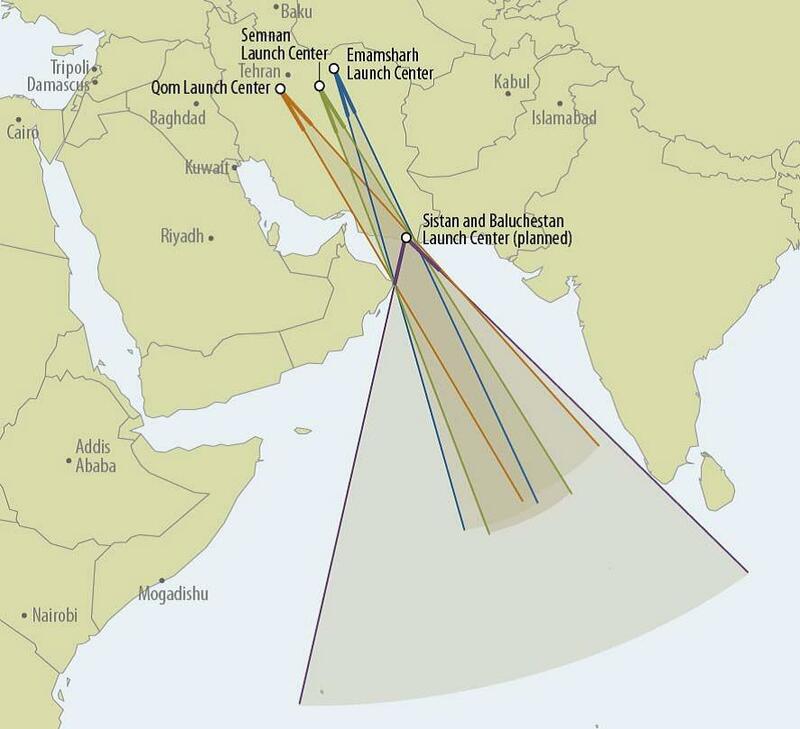 This site will provide possible failed launches to occur over wide swaths of the ocean rather than land. Iran will have a broad span of possible launch vectors to send a satellite carrying a nuclear weapon over the south pole to detonate over the U.S. in its maiden orbit. 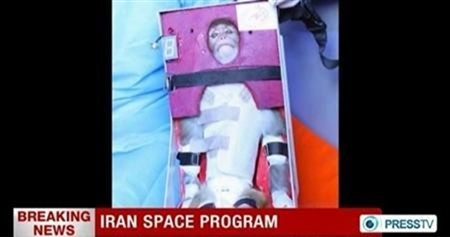 Furthermore, Iran launched a monkey into space and returned it to earth last January 28th. The satellite was reported to have weighed 4400 pounds, lots more than needed to carry a rather heavy nuclear weapon. The press indicates great concern that this launch demonstrates Iran’s capability to launch an intercontinental ballistic missile (ICBM) to attack the United States once Iran gains a nuclear weapon. This concern validates the congressional direction to the Obama administration to consider additional ways to defend the Eastern seaboard from Iranian ICBMs that would approach the U.S. from over the North Pole—to strengthen the limited capability of our missile defenses based in Alaska for such scenarios. This is a reasonable concern. However, notably missing so far is any apparent consideration of the threat Iran could pose by launching a satellite carrying a nuclear weapon over the South Pole, to attack the United States from the south. Of course, the Outer Space Treaty bans stationing a nuclear weapon in space. And if the nuclear weapon is only intended to travel half an orbit before detonating over the United States, perhaps Iranian sharp lawyers may argue it isn’t stationed in space. On the other hand, Iran is a signatory to the Nonproliferation Treaty and they are already violating that treaty by building a nuclear weapon as essentially everyone understands. Better to have a defense against this threat—and soon! If anyone is listening, please shut the back door. Previous post: Hack Twitter Account, Crash the Market?